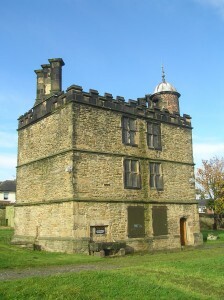 Sheffield Manor Lodge, Sheffield, Yorkshire – This manor was built by the fourth Earl of Shrewsbury and is famous for being the place where Wolsey stayed as he journeyed to London to stand trial and as the place where Mary Queen of Scots was kept under house arrest by the sixth Earl of Shrewsbury, George Talbot, and his wife, Bess of Hardwick. Following its appearance on series 2 of the BBC2 “Restoration” series, a bid to the Heritage Lottery Fund was successful for £1.25 million. This has resulted in a new Discovery Centre , a revamped Turret House and landscaping. Click here to see a map of where Sheffield Manor Lodge is located. 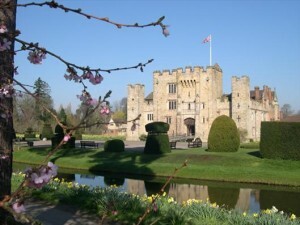 Hever Castle and Gardens, Edenbridge, Kent – This Tudor house is famous for being the childhood home of Anne Boleyn and for being given to Anne of Cleves, Henry VIII’s fourth wife, after their marriage was annulled. The house and gardens were lovingly restored in 1903 by William Waldorf Astor. Click here to see a map. Hardwick Hall – This was once the home of the famous Elizabethan character, Bess of Hardwick (Elizabeth, Countess of Shrewsbury). Click here to see a map. Hatfield House, Hertfordshire – This former royal estate was given to Sir William Cecil by Elizabeth I. A Jacobean house was added to the estate in 1611 by Robert, Earl of Salisbury, Cecil’s second son. Click here to see a map. Burghley House, Stamford, Lincolnshire – This beautiful house was built, and partly designed, by Sir William Cecil, Lord Burghley, Elizabeth I’s Secretary of State It is said to be the finest Elizabethan mansion in the whole of England. Click here to see a map. Shakespeare’s Birthplace Trust, Stratford-upon-Avon, Warwickshire – The trust incorporates five houses in Stratford-upon-Avon which were all connected to “The Bard”, William Shakespeare. You can find out more about these houses at www.stratford.co.uk/properties.asp and they are: Mary Arden’s House, Anne Hathaway’s Cottage, Hall’s Croft, Nash’s House and Shakespeare’s Birthplace. A map can be found at http://www.stratford.co.uk/map.asp. You can also see Shakespeare’s plays performed by the Royal Shakespeare Company (RSC) while you’re in Stratford – see www.rsc.org.uk/home/ for details of what’s on. Melford Hall, Suffolk – This lovely Tudor mansion was visited by Elizabeth I on her 1578 royal summer progress and has also been visited by famous characters like Florence Nightingale and Beatrix Potter. Click here for a map. Kentwell Hall – This hall is close to Melford Hall and is known for its costumers and re-enactors who bring the Tudor period to life. Click here to see a map. Tudor Merchant’s House, Tenby, Pemrokeshire, Wales – This merchant’s house near Tenby dates back to the late 15th century and has been restored by the National Trust to give an idea of what Tudor family life was like. Click here to see a map. Paycocke’s, Colchester, Essex – This National Trust property is an early Tudor merchant’s house. Click here to see a map. Barley Hall, York – A restored medieval/early Tudor house where visitors can handle things and build a picture of what life was like in Tudor times. Click here to see a map. Coughton Court – Coughton Court has belonged to the Throckmorton family since 1409 and is a beautiful stately home. If you think that the name “Throckmorton” sounds familiar, it’s because the Throckmortons were an important family at the court of Henry VIII and were involved in the Gunpowder Plot of 1605. I can recommend Coughton as I grew up just 2 miles away. 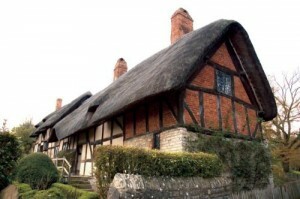 It’s also only around 10 miles from Stratford-upon-Avon. Click here to see a map. Wroxall Abbey, Wroxall, Warwick, Warwickshire – Wroxall Abbey dates back to the 12th century when Sir Hugh de Hatton gave the priory (The Black Nuns community) the whole land of Wroxall. The priory was badly affected by the Dissolution of the Monasteries in Henry VIII’s reign but the estate later became the home of Sir Christopher Wren (architect of St Paul’s Cathedral in London) in 1713. Click here to see a map. Compton Wynyates House, Compton Wynyates, Warwickshire – A Tudor manor house built by Sir William Compton, one of Henry VIII’s close friends. Henry VIII was a frequent visitor and the King’s arms can still be seen in a stained glass window. It is now the seat of the Marquess of Northampton and can only be visited by permission gained from written application. Click here to see a map. Coombe Abbey, Coventry – You can still enjoy medieval/Tudor style banquets at this Tudor property – I have, they’re wonderful particularly the mead, yum! The abbey was originally a Cistercian abbey built in the 12th century but has been restored into a beautiful hotel. Find out more about its medieval banquets at http://www.coombeabbey.com/events/mediaevalbanquets.htm. Click here to see a map. 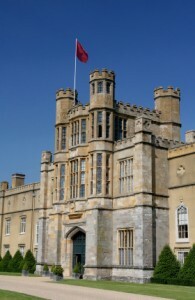 Corsham Court, Wiltshire – A manor that once belonged to Elizabeth of York, Henry VIII’s mother, and which was given by Henry to Catherine of Aragon and then Catherine Parr. Click here to see a map. 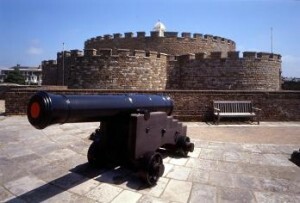 Deal Castle, Kent – One of the fortifications built by Henry VIII to defend England, Deal Castle is also famous for being the place where Anne of Cleves stopped on her arrival in England. Click here to see a map. Dunster Castle, near Minehead, Somerset – This castle is famous for its part in the War of the Roses and dates back over 1,000 years. It was remodelled in the 19th century and has lovely gardens and wonderful views over the Britsol Channel and Exmoor. Click here to see a map. 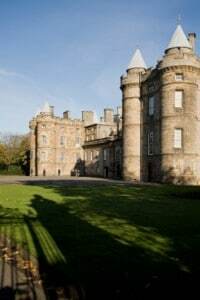 Holyroodhouse, Edinburgh – The Palace of Holyroodhouse is where Mary Queen of Scots lived as Queen of Scotland and where she was imprisoned by Elizabeth I. It now also the Scottish Royal residence of Her Majesty Queen Elizabeth II. Click here to see a map. Little Moreton Hall, Congleton, Cheshire – A lovely Tudor house which is said to be one of the UK’s finest timber framed, moated manor houses – beautiful! Click here to see a map. Gawsworth Hall, Macclesfield, Cheshire – This is an exceptionally beautiful Tudor manor house which was originally a Norman house but was rebuilt in 1480 and then remodelled in 1701. It was the home of Mary Fitton, said to be the “Dark lady” of Shakespeare’s sonnets, who was Maid of Honour to Elizabeth I before she caused scandal by becoming pregnant by the Earl of Pembroke. Click here to see a map. Rufford Old Hall, Near Ormskirk, Lancashire – A beautifully preserved Tudor hall which is home to rare wooden screens and a spectacular Great Hall where a young Shakespeare is said to have performed. Click here to see a map. Buckland Abbey, Yelverton, Devon – A 700 year old National Trust property that was once home to Richard Grenville and Sir Francis Drake. Click here to see a map. The Lost Boleyns – Claire’s still digging! Adore this Castle of Ann Bolyn’s where she was born and raised before marrying Henry VIII where she lost her head due to the fact she could not produce a male child as heir to the throne of England. Lovely 2 mote castle.